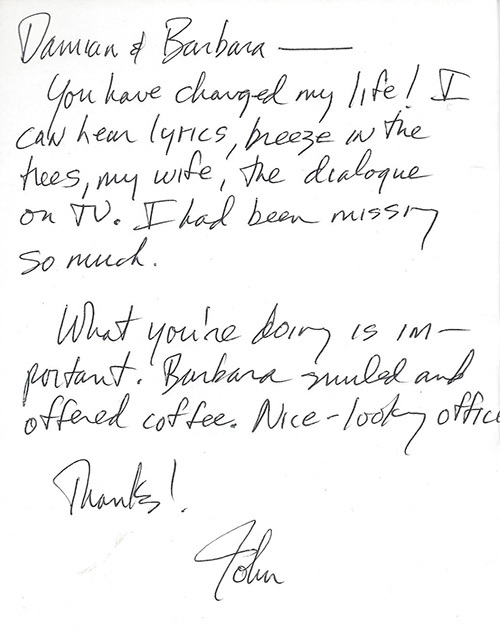 "Our clients are the best and their kind words mean the world to us." I was offered a complimentary hearing test and received a personal and professional consultation thoroughly informing me of the options and benefits of hearing aids. SoundChoice went the extra mile to improve my hearing. I highly recommend SoundChoice Hearing. Most customer oriented business I have dealt with in a long time. Chrissy is a jewel. If I had a business, Chrissy Pease is the kind of employee I would want working for me. I purchased a set of high-end hearing aids from an online website, and subsequently found that the merchant offered limited adjustment services, inadequate for my needs. 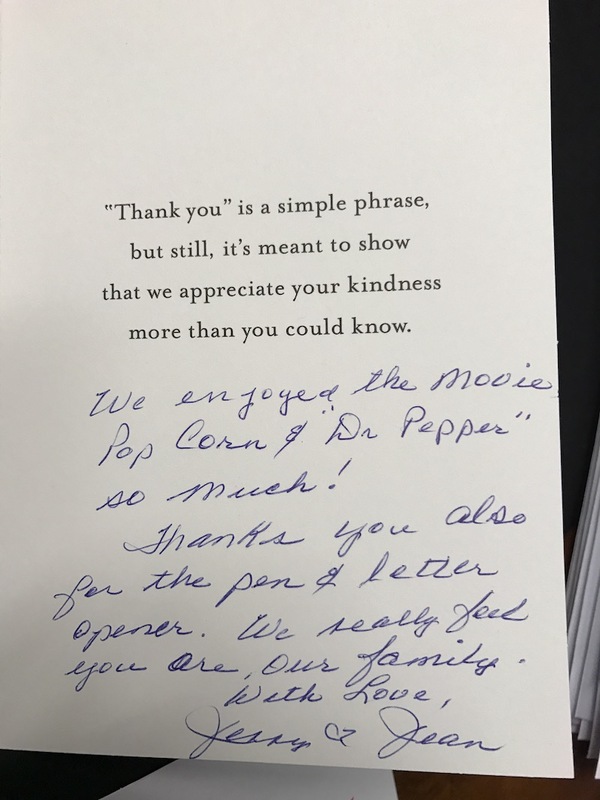 The folks at Sound Choice were able to fine tune the instruments to my degree of hearing loss, and performed a number of other unexpected services as well. They discovered that my hearing aids were not under warranty as they should have been, and they arranged with the manufacturer to cover them for a two-year period. After my initial encounter with the Sound Choice staff, I ran into a number of additional difficulties with the software controlling the devices, and Damian and his associates were able to correct these problems with no difficulty, and on some occasions on short notice with no appointment. Finally, I want to point out that I attempted to purchase a fairly expensive product from Sound Choice (rechargeable battery functionality) and Damian declined to sell it to me, noting that the technology was problematic and that I should wait until irregularities had been resolved by the manufacturer. Sound Choice is a highly customer-oriented business. My hearing is the best it’s been since I started losing it ten years ago! After seeing four or five other providers, I bought my first pair of hearing aids about three years ago. My hearing has gotten worse, so this time I decided to give Sound Choice Hearing a try. I can honestly say that Damian Castillo is, hands down, the best. It is very clear that he genuinely wants to help you hear better. My wife went with me to my appointments, and he thoughtfully adjusted her hearing aids for her even though she hadn’t purchased them from him! Damien helped me pick the best, most affordable solution for my condition. He explained everything clearly and patiently answered all the tons of questions that I asked. My earlier hearing aid provider had a thorough, detailed contract of exactly what they would provide which also implied what they wouldn’t. In contrast, Damian said, “Just come back to see me when you need anything-- more batteries, an adjustment, etc.” It’s clear that he is genuinely committed to me as a customer, and not just fulfilling some contract. 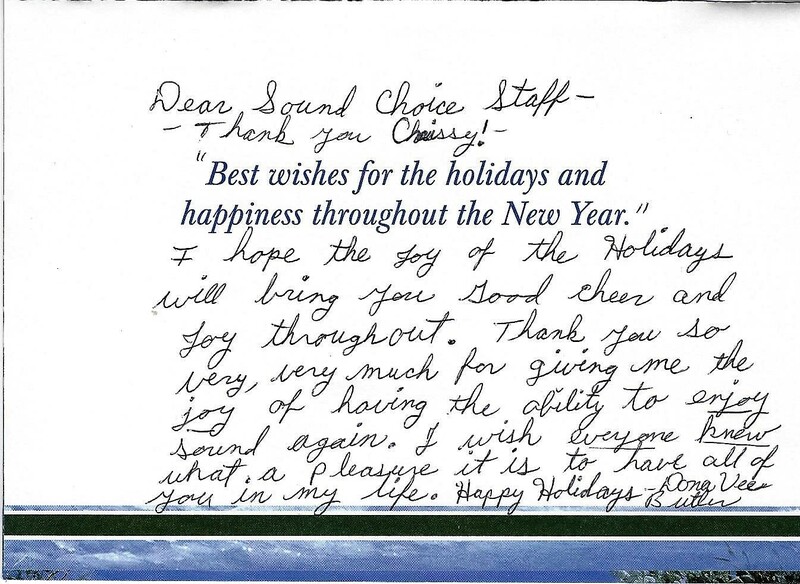 I wanted to take a minute and say “thank you” to you and your staff at Sound Choice. I consider myself a smart consumer who does a good amount of research before making a decision, especially when it comes to something as important as my ability to hear again. After researching the hearing aid industry for a couple of years I found myself completely flustered with the overwhelming amount of information flooding the market, including a large amount of misleading advertisement. Through my research I found out about your office and made my first call for an appointment. The whole experience has been outstanding. Based on your recommendation I purchased a pair of hearing aids about nine months ago and am very happy with my improved hearing ability and options with the product. However, the purpose of this email is to let you know how happy I am with your customer service and the care your entire staff has for their clients. You guys always call me to see how things are going and to make sure I’m scheduled for my follow-up visits. 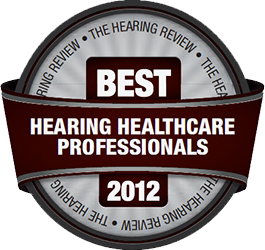 My hearing is important and I want it to be the best it can be, therefore, I find myself looking forward to my visits and seeing your team, getting an adjustment or educated about what is new and - receiving the best service possible. Nothing is as good as your natural God given hearing … but my Oticon hearing aids are the next best thing! The imperceptible loss of hearing over time, slowly and methodically disconnects you from your family, friends and the world. It robs you of the full richness of life itself. When you finally recognize that loss and take the first steps toward improvement, the expectations exceed technology … but significant improvement is available if you do your homework, find the best technology and care provider and commit to improvement. That’s what I did when I did my research, chose SoundChoice Hearing and the Oticon hearing aid, teamed up with a hearing specialist and committed to doing whatever was necessary to reconnect with the world. Chrissy Pease performed the hearing exam, determined the range of lost hearing and helped me begin my journey of improvement. Subsequent to a no commitment trial, I chose the Oticon “Opn 1 miniRite” hearing aid because of its reported functionality and its discreet nature. I haven’t been disappointed. With some tweaking for optimal functionality and the consistent and continual follow through of Chrissy, I have significant hearing improvement. I had no idea what I was missing until I began this journey back. I recently purchased the Oticon Opn hearing aids and have found them to be the most useful and effective devices I’ve ever had in the 8 years I’ve been wearing hearing aides. I’m a pianist and have enjoyed attending symphony concerts most of my life. Recently I heard the Brahms Piano Concerto #1 with the Santa Fe Symphony and was literally reintroduced to the magnificent presence and sonority of the orchestra and piano. Amazing what I hadn’t heard in a long time! Coming into Sound Choice to get a hearing tested and purchase hearing aids was the best experience I had!! In my previous experience at a different hearing place, I was talked to very loud! I wanted to tell them stop talking to me like that I can hear you!! 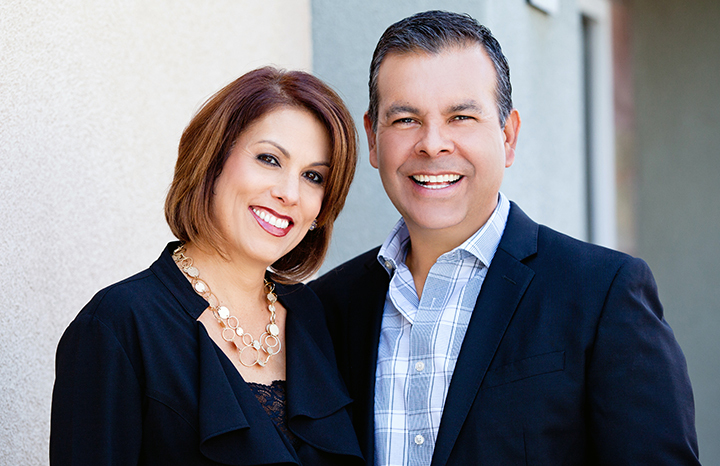 And was not introduce to new hearing aids!I been without hearing aids for a long time and knew eventually I was going to have to buy some.My husband was listening to the radio one morning and heard Damian Castillo on the radio talking about hearing loss. My husband started to encourage me to speak with Damian and make an appointment with him. I came to see Damian and I walked in with a warm welcome from staff and I also was excited to see a sign stating "welcome April Perkins!" It brought a smile to me and my husband to know we are being cared for!! (Even took a picture of the sign with my name on it) Damian welcome me and my husband, he talked to us, he was patience, talked to me normal and I felt comfortable! Damian introduce me to new hearing aids that was best for me and a streamer! I instantly enjoyed the streamer because I was able to listen to music through my hearing aids and can talk on the phone through my hearing aids! Plus now I can hear a lot better! 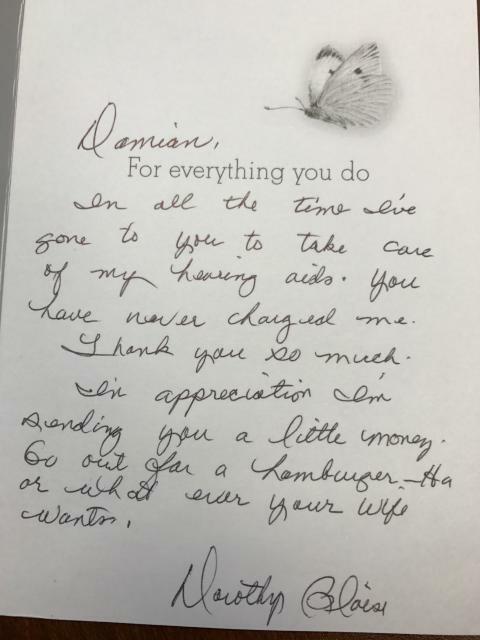 I love my new hearing aids and I am glad my husband heard about Damian Castillo!! I enjoy coming to see Damian and staff members!!! I would recommend people with hearing loss or in need to get hearing checked out to go to SoundChoice Hearing and see Damian Castillo! Thank you for the wonderful experience and positive environment! I was fitted for my very first hearing aids by Damian when he was with another hearing aid facility. I had my hearing aids for almost 8 years and realized it was time for me to replace my old ones. I found Damian at his beautiful new offices and he once again found the perfect hearing aids for me. I hadn’t realized how bad my old ones were! When playing tennis the next week after getting my new hearing aides, I was so excited to realize that I was the first one to hear the Sandhill cranes high above us! That had never happened before. It also helps to hear the tennis score called the first time instead of asking more than once to repeat the score and someone having to yell out the score! That makes my tennis buddies very happy! A couple days after getting my hearing aides I was talking to my daughter on the phone when she realized at the end of the conversation that I hadn’t once asked her to repeat what she said. She seems to be as grateful as I am! I wore my old hearing aides for too long and delayed getting new ones because "they weren’t broken." I had no idea how much I was missing and regret not getting new ones sooner. My family and friends are the only people who may be happier than I am with my new ears! 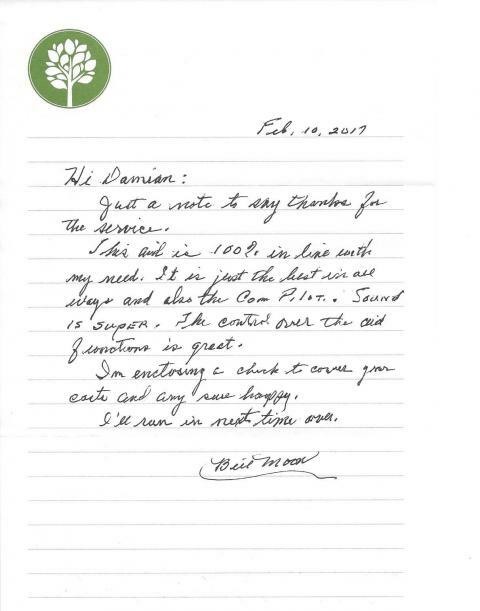 Thank you, Damian & SoundChoice Hearing! The ladies are friendly. The staff are all friendly and helpful, very professional and thorough. A pleasure to do business with them. The lobby is clean and orderly. I like the personalized service and the friendly staff. I especially like being able to hear and having bluetooth for my cellphone. Dynamic, energized and excited team of professionals. He is excellent! First specialist I’ve come to for my ears and I’ve stuck with him. Thanks to Damian and Christy Castillo and sound choice hearing. Mom can really hear now. We had a lovely lunch and the background noise didn’t bother her and I didn’t have to yell. Mom loved the personal service and detailed explanation. The sign welcoming her and treats were a hit too. I appreciated the professionalism and state of the art technology. Keep up the good work! we are back in Europe and the jet lag is history also. Fred tried the gizmo we bought the day before our flight and it works perfectly well. He uses it for tv only and managed to get our satelite tv, terrestial and some other one we have in Belgium. You did not promise too much. Thank you again for one of the best experiences -and purchases – we made while in Albuquerque. Fred can hear much better than before and all is well. I am Gloria Amen’s daughter, Danielle. I have met you several times and I really admire how helpful and courteous you are to my Mom. 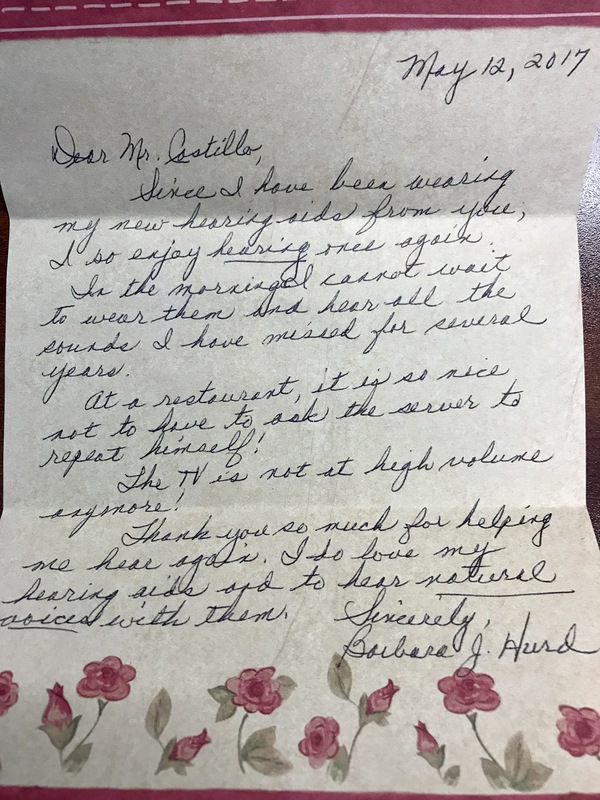 I want to thank you so much for giving her her hearing back! It is truly a Christmas miracle for our family! You know how profound my Mom’s hearing loss is, and she was constantly struggled to just live a normal life and missed so many things because of her hearing loss. Now, you two have given her life back and our Mom back. She is so much more at ease, because she doesn’t have to struggle to try to hear us and she doesn’t have to guess what we are saying. This Christmas is going to be so special for us, because of your help to her. 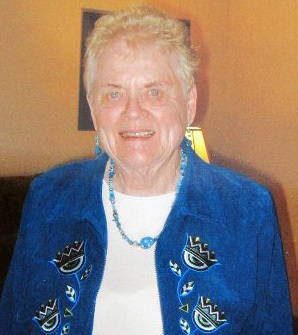 She will finally be able to hear and uderstand her Grandsons! Words alone can’t thank you enough! You two are doing what God wants you to do. He has blessed you two with a wonderful gift. Merry Christmas and God Bless you and your family. Just wanted to let you know that everything is working great and all is well. Thanks for the time and patience and helping to make things right. You run a first class operation and really care about your clients. A refreshing thing in today's world. OK, the hardest part about acclimating to these new guys? The noise from typing on my cheap keyboard at work! I’m going to have to get a new one! I want to first off thank you profusely for your great work with me this afternoon. The process was quick, efficient, very respectful and the technology is simply amazing. I was getting pretty emotional there in your office; but I’ll tell where it got really emotional. From your office, I went up to Laurie’s school and although she wasn’t available, just the high sounds of children playing that I never really heard before blew me away. I’m simultaneously saddened and delighted at discovering what I’ve missed, without even being aware of it. So, again, I can’t thank you enough. You must have the gratifying job in the world: you’ve certainly “torn a veil” from my life that is currently nothing short of jaw-dropping. I’ll have some questions and I’m sure once I get used to them, I may even have a complaint; but right now, I feel like I’ve been handed a new life. 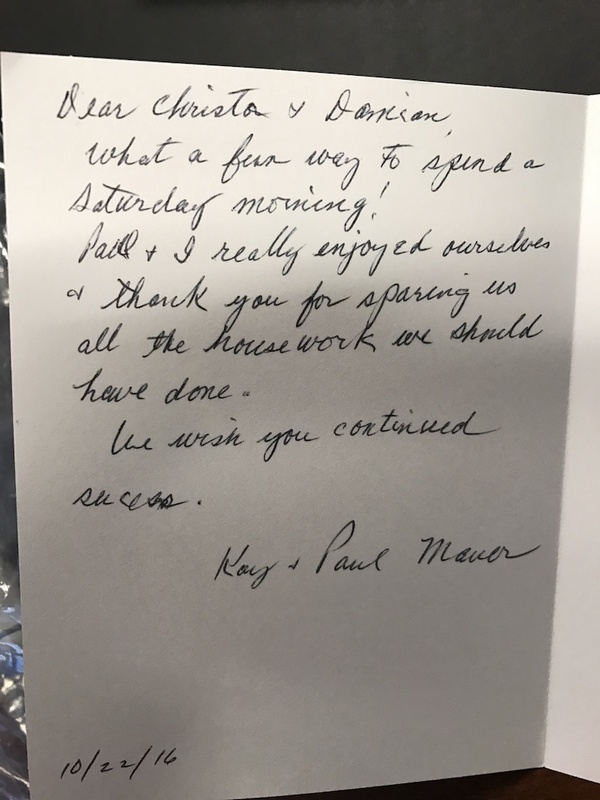 My experience has been fantastic - beginning at the time I arrived at your office for the first time and saw the "Welcome Ruth DeHaven" sign on the counter!! This had naver happened before at any office under any circumstances!! I was impressed. Then came my hearing test and subsequent introduction to these "new" hearing aids!! I couldn't believe they were so simple to use and maintain. The fact that they "beep twice" to indicate a low battery was also an innovation and actually, a very convenient one!! I have since come to the conclusion that these hearing aids are the closest I will ever come when it comes to "normal sound. That is, sounds that are actually identical to those I have enjoyed all my life when normal hearing was a way of life. Makes no difference when enjoying conversation with a group of people, listening to the phone, attending church or any other occasion - my hearing is as its always been. The sound is as its always been. Its been a pleasure to recommend these hearing aids to friends who have a hearing problem and in the case of one, this person has her new hearing aids and thanks me for reffering her, and another is in the offing! My Hearing problem has been solved! Int the past few years I have had to purchase 4 different kinds and brands of hearin devices. The quality of my hearing was not clean and natural and was frustrating. Last year I went to SoundChoice Hearing and Damian examined and fitted me with the new Oticon hearing device. The quality of sound and comfort is so great and so natural that I really forget I am wearing anything to enhance my hearing. Both devices can be adjusted while I'm wearing them as situations change and in mere seconds. Damian is a genius! he knew exactly what my loss of hearing required. I can't thank him enough!